My mother, Martha, Eve and I are all three featured today on the Etsy blog, the Storque. The story is part of a series showcasing mother and daughters who craft. Here is the link for your viewing and reading pleasure. 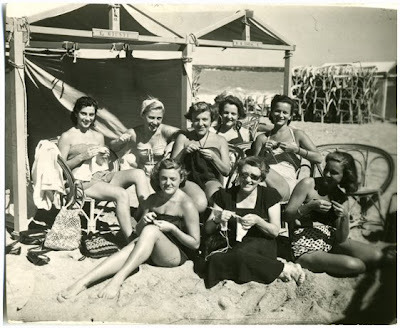 The picture was taken in the early fifties on the beach in Mar del Plata. My mother is the cute blond one in the back row. She was there with a bunch of her cousins, they were all learning how to knit from her aunt pictured in the foreground with the sunglasses. Cheers to mothers and daughters! Wow, what a beautiful article - full of love and inspiration and sweet work. I shared it on my Facebook page, and I love that it was in both English and Spanish. Roxana, you must be proud - that really made my morning. Thanks so much for dropping in and sharing this piece on facebook! Indeed I am very proud and adore that we all live in the art spirit. Hope it encourages others to do the same. This is the most fun picture ever! We should all learn to smile everyday. I am going to now quickly check for the '4711' spritzer before I forget. WIll check the Storque too! How cool is that, congrats! Love that photo! I'll give you a heads up when I list the Cologne sample. I've been finishing up the EarthDay solid perfume and haven't had a chance to photograph the spritzer. Thanks so much for stopping in, happy weekend to you too! Very cool indeed! Thanks for stopping in.